Milwaukee<sup></sup> Step Drill Bits with JAM-FREE Performance feature a dual-flute design delivering up to 2X faster hole times, up to 4X longer life and up to 50% more holes per battery charge than competitors.Ideal for drilling small and large-diameter holes in steel and plastic, these bits are Optimized for Cordless Drills in High Speed. The Rapid Strike tip allows for a fast and accurate start that generates less heat, resulting in longer bit tip life. Black oxide coating also enhances durability, hole quality and bit life. For user convenience and accuracy, each bit has laser-engraved reference marks you can see while drilling. The 3-flat Secure-Grip shank ensures a solid connection with the drill chuck. The #9 Step Drill Bit has 2 hole sizes: 7/8-inch and 1 1/8-inch. Jam-Free Performance in high speed with most professional 18 volt cordless drills with lithium-ion battery technology. Milwaukee M/2 2-Cutter SDS-Plus Rotary Hammer Drill bits are the Most Durable 2-Cutter bits with up to 20% more holes per charge in cordless rotary hammers. The enhanced rebar guards provide increased durability in hard aggregate and rebar. Breaker Point pulverize the material more effectively resulting in faster drilling speeds. The variable flute allows for maximum debris extraction leading to up 20% more holes per charge in cordless rotary hammer while making it a very durable bit in corded and cordless rotary hammers. Additionally, M/2 features a centering tip for exact spot drilling, wear mark indicator indicating when the bit no longer meets ANSI diameter requirements, and a reinforced flute for durability and minimized vibration. The increased life and efficiency of the M/2 2-Cutter drill bit line provides the ideal solution in general concrete for cordless and corded rotary hammer users. Milwaukee Shockwave Impact Duty Insert Bits are engineered for extreme durability and up to 10x life. Made from proprietary steel and heat treated to control hardness, the Shockwave Impact Duty Insert Bits feature an innovatively designed geometric shock absorption zone to extend life. The forged tip allows for a secure grip and maximum contact eliminating stripping or slipping. Milwaukee Thunderbolt<sup></sup> Black Oxide Jobber length drill bits are designed for extreme durability and long life. The Thunderbolt<sup></sup> web features a thicker core than a standard drill bit, which provides ultimate strength and protects against side-load breakage. A specially designed parabolic flute form clears chips and debris fast to keep the bit cool. A precision start, 135 Split Point tip starts on contact to keep the bit from walking for fast accurate holes. Excellent for drilling on curved surfaces, requires less effort to drill and is highly recommended for use with portable drills. The 3-Flat Secure-Grip shank won't slip in the drill chuck. Reduced shank diameter for use in 3/8-inch chucks. 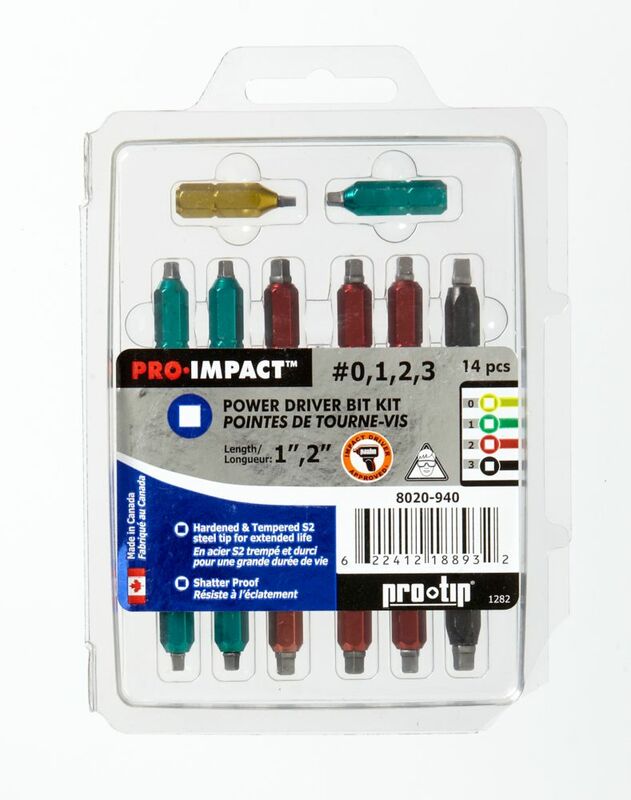 14-Piece Pro-Tip Bit Assortment Kit Premium screw driving bit.